December 4, 2011 Nefer Khepri, Ph. D.
Although published by US Games, if you are interested in collecting decks as I am, you will want to dish out the extra cash and treat yourself to the self-published version of The King Solomon Cards (available from the link above) for several reasons. The cards come housed in a sturdy wooden box with a metal hinged lid and metal latch (gold color for all). There is a clear sticker on the lid with the title of the cards and this makes it look like the title is printed directly on the wood. The base of the box has another clear sticker that has the publishing information. The colorful label you see in the picture slides right off the box. I am trying to keep mine in good condition so I keep it around the box when the cards are not in use. Within the box you will find one 3 X 5″ 54-page guide book. The cards measure 3 X 4 3/4″ and there are 36 cards, plus four extra cards you can use as amulets to bring you various blessings. The base of the interior of the box is lined with felt and the cards come wrapped in a bluish lavender silk cloth. This is a VERY nice packaging job and if I could package my own deck in any way I wish, I would choose this method myself. The cards have a nice laminate on them. It’s not stiff so the cards are easy to shuffle, yet the laminate is good enough that the cards will stand up to years of shuffling. 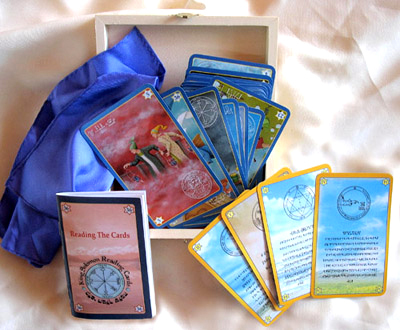 Each card is numbered, 1 – 36 and the interpretations in the guide book contain the same numbers so it’s simple to find each card that appears in a reading. The photo here shows you the color of the cloth, the guide book (lower left), the deck of cards, and the four bonus cards (lower right). The cards have a dark blue border and the card backs are light aqua-blue. The artwork by Orna Ben-Shoshan, is characterized by lovely bright colors. Rendered in the same whimsical style as her 72 Names of God deck, the cards are illustrated with figures in surrealistic dream-like settings and landscapes. Personally, I find the deck to have a very nice “feel” to it. It has good energy and I was able to start using it for readings right out of the box. It did not require cleansing or charging prior to use. Readings are concise and the authors recommend you draw only one card for each question and that you do not approach the deck with the same question twice in a week, which is really good advice for any type of tarot or oracle deck. The card interpretations are provided on four levels: Situation, Person, Advice, and they each also have an inverted meaning in case they appear reversed in a reading. Interpretations are short and to the point. This is a good deck for beginners as the system itself is quite simple to grasp and the deck provides insightful readings. This is a delightful set of cards and personally, I really enjoy using them, and I hope those among you who decide to purchase this deck also enjoy them. Note that this same deck is also published by US Games and is available on Amazon, but it is only packaged in a typcal tarot-type cardboard box and does not contain any of the nice extras that you get with the self-published version. The photos for this deck review are of the self-published version, only.